We want everyone to be able to swim whenever they want! That’s why Ulricehamns Kallbadhus is open every day from 6am to 10pm, all year round. You can purchase a day pass at OKQ8 (a nearby petrol station) or Ulricehamns Tourist Office, more information can be found under the tab prices. Come here a swim, when it suits you. Day pass: Adults and children over 12 years – 60 SEK per person. Children up to age 12 free of charge accompanied by an adult. Day passes can be purchased at OKQ8 (Petrol station on Boråsvägen 9) or Ulricehamns Tourist Office (Järnvägstorget).Note that day passes are only valid for the day you buy them! Annual Pass: 1200 SEK per person. Membership fee for Ulricehamns Kallbadhus Association is included in the price. Starting in 2015, annual passes are valid per calendar year. If you want an annual pass for 2014, pay 100 SEK for each remaining month of the year. Example: If you pay in May, it will be 800 SEK, if you pay in June it will be 700 SEK and so on. Annual Passes can be purchased at OKQ8 or by transfering the money to bank-giro 5413-8409. Remember to state your name and address to which the card should be posted. It takes about 10 days before you receive it. Membership fee: 200 SEK per person per calendar year. The membership fee can be paid to bank-giro 5413-8409. Mark the payment with your membership number or your name and address, if you were not a memeber previously. Membership includes certain membership benefits such as discounted rates at some companies in Ulricehamn and the opportunity to participate in themed evenings, which is only for our members. We sell sauna skirts, bathrobes and towels. Contact us for purchase! Does your company want to sponsor Ulricehamns Kallbadhus Association and appear on our site? Contact us! In Ulricehamn the tradition of health and well being has been a hallmark of the city. Around 1870, there was a popular bathhouse at Fiskebacken in lake Åsunden. It was used so extensively that by 1904 it was so worn down that it was demolished, to many of Ulricehamns inhabitants despair. Immediately after the demolition, discussions regarding a new bath house started, which became a reality through the newly formed Society Ulricehamns Friends. Near what is now known as Sturebadet a new bath house was erected in record time, and was completed in 1909. The people of Ulricehamn were overjoyed and the new bath house became very popular. Like many other things that are used a lot, eventually this bath house also became worn. Instead of renovating it the bath house was torn down in 1945. Ever since then, something had been missing in Åsunden. It took 60 years, but the people who wait for something good, never wait too long. In 2005 some enthusiasts formed Ulricehamns Kallbadhus Association to renew the dream of a new bath house in Ulricehamn. With support from entrepreneurs, associations and individuals, and a loan from Ulricehamns municipality the dream became reality three years later. 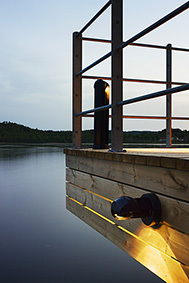 In March 2008, a brand new bath house was inaugurated in lake Åsunden, Ulricehamns Kallbadhus. Many of the near 500 members of Ulricehamns Kallbadhus Association joyfully use the bath house, joined by many visitors from other towns and places. All enjoying the spectacular view of the town of Ulricehamn and lake Åsunden. Welcome! Boosts blood circulation in the body, it is especially effectively to switch between cold and warm. Is good for your skin, cold causes your pores to closes and makes you look younger. Said to cure depression. An American university has noted in their research that it seems that cold showers stimulate the part of the brain that produces norepinephrine, which can suppress the symptoms of depression. Makes you alert and full of energy because the cold shocks body. For the same reason, it is important to take it easy the first few times you go in. Stimulates the immune system, according to a British study from the 1990s. Most likely it’s because the cold water cools the body so much that it responds by raising metabolism and therefore produces more white blood cells. Strengthens the mucous membranes and is therefore alleviating, for example people with allergies.